Mana Maoli has produced audio-books and E-Mo’olelo for the following Hawaiian mo’olelo: Kahalaopuna, Kamapua’a, Keaomelele, and The Wind Gourds of La’amamao. The audio-book provides audio narration and chanting to the text of these stories that can be listened to in your CD player, at home, or while drivnig. The E-mo’olelo provides the story in PowerPoint format (.ppt), with each slide sharing a section of the story through audio narration and chanting, written word, and original photography. Lesson plans were also developed to address core content areas, with questions often geared toward HSA testing. Please contact us if interested in learning more about this project. The word kumuhele refers to a type of lashing used on the outrigger of a chief’s canoe. It is our hope that this curricular package is a tool used to tightly bind the core connecting areas to the rich moʻolelo Hawaii. We encourage kumu and opio to take this example and create your own eMoʻolelo and audio books with moʻolelo that are pili to your school and your wahi pana aloha. Audio-Book. The moʻolelo is provided in an audio format, for use in the classroom and for students to listen to on their iPods, in the car, or on the bus. Where there are oli in the text, the Hawaiian version is recorded. An appendix at the end of the audio book contains all the oli in order of their appearance in the text, in Hawaiian with English translations. eMoʻolelo. The moʻolelo is provided in a multimedia format. Using Keynote or PowerPoint, an original image(s) is used to aid the student in further interpretation of the text in addition to the audio. 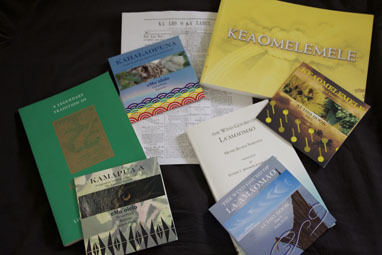 Kamapuaʻa and Keaomelemele include comprehension questions at the end of each chapter or issue. Lesson Plans. For select moʻolelo, standards based lesson plans are provided in language arts, science, and math. The lesson plans are meant to be a guide and can be personalized by the kumu. Sample Hawaii State Assessment (HSA) Questions. Sample HSA questions are provided to aid students in practicing for the HSA using themes and content from the moʻolelo.